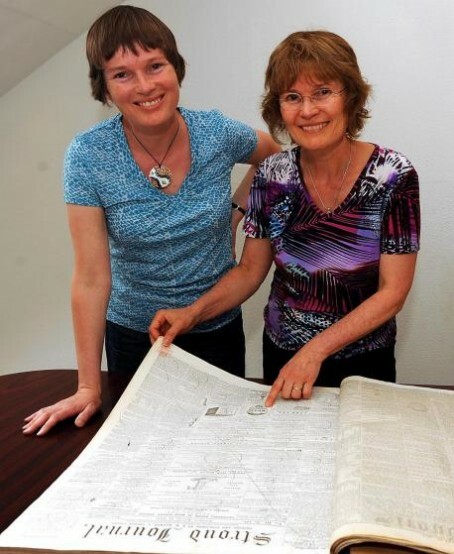 The great-great-granddaughters of a man who founded a long-running weekly paper over 150 years ago flew more than 3,500 miles to see behind the scenes of their ancestors’ legacy. William FW Harmer launched the Stroud Journal in 1854 and remained as editor for four years before emigrating to Canada with his wife Bertha and daughter Lois in 1858. And this week the family returned to their roots when Kate Gibson Oswald and Beth Gibson, William FW Harmer’s great-great-granddaughters, visited the UK from their new home in British Columbia. They were given a tour of the Stroud News and Journal offices and flicked through the paper’s archives – and editor Sue Smith said they were delighted when they came across copies of their relative’s first papers. “It was lovely to meet the great-grandchildren of the founder of the Stroud Journal. We were so glad they took the time to come down,” she said. “The sisters thought they would just be having a look around the building and were thrilled to find we still had copies of his first papers from the 1800s. “It was quite moving flicking through those first editions knowing that the direct descendants of William FW Harmer were standing right there. The Stroud Journal amalgamated with the Stroud News in 1957 to become the SNJ, which has published the story on its website.